Let’s discuss a topic not often considered in discussions related to your roof. Namely, eavestrough protection. Many homeowners view eavestrough protection products as a luxurious item that simply saves you from the hassle of having to clean your eaves trough ever again. But the reality is that eavestrough protection is actually quite practical and can absolutely save you more money over the time of your home ownership than the initial upfront cost. 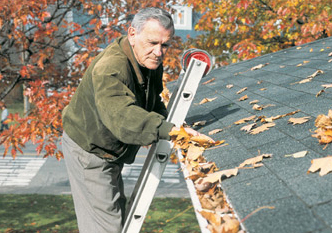 The first way it can save you money is by extending the life of your eavestrough. The most simple way I can put it is this: imagine you are holding an empty bucket. Your job is to hold the bucket for as long as possible. Meanwhile, some jerk comes along and one-by-one starts filling your bucket with stones! Naturally, as the bucket fills up you become more and more tired. Now consider that your bucket has a covering on top of it, preventing the stones from dropping in. You are going to be able to hold the bucket for a lot longer! Now, naturally, installing eavestrough protection on eavestroughs that are already hanging on by a thread is not particularly advisable. But installing eavestrough protection on new (or newish) eavestrough can and WILL extend the life of your eavestrough system by the simple fact that heavy debris is not permitted to sit down inside. Now what about the impact that eavestrough protection has on your roof system? The number one way eavestrough protection extends the life of your roof is by preventing ice dams. How does it do this? First we need to look at why ice dams form in the first place. Ice dams form for one of two reasons. First, the eavestrough is sloped incorrectly and water cannot drain away to the downspouts. Eavestrough protection remedies this by ensuring that your eavestroughs remain as well sloped as they were when they were initially installed by not allowing heavy debris to pull the slope off. Secondly, ice dams form because debris in the eavestrough blocks the path of water to the downspouts, causing build up. With a proper eavestrough protection system in place, there will be no barriers inside the trough for any water impedance! So how much does eavestrough protection cost? Well, it depends on what product you would like to have installed. Prices can range anywhere from $5 to $12 dollars per linear feet of eavestrough, depending on the difficulty of the job (slope of the roof, ladder access etc) but primarily the kind of product you select. The base level product that I would recommend is a product called Alu-Rex. The reason I say this is the cheapest product I would recommend is because, in my experience, almost all cheaper products out there inevitably fail in pretty short order. This is the cheapest product that works. A higher end product that I would recommend comes from a company called Diamond Back Gutter Covers. Their products retail for anywhere from $9-12 dollars depending on the make. One of the key differences between Diamond Back and Alu-Rex is that Diamond Back is a convexed covering that arches over the trough providing an easy escape for debris, whereas Alu-Rex sits slightly inside of the eavestrough.